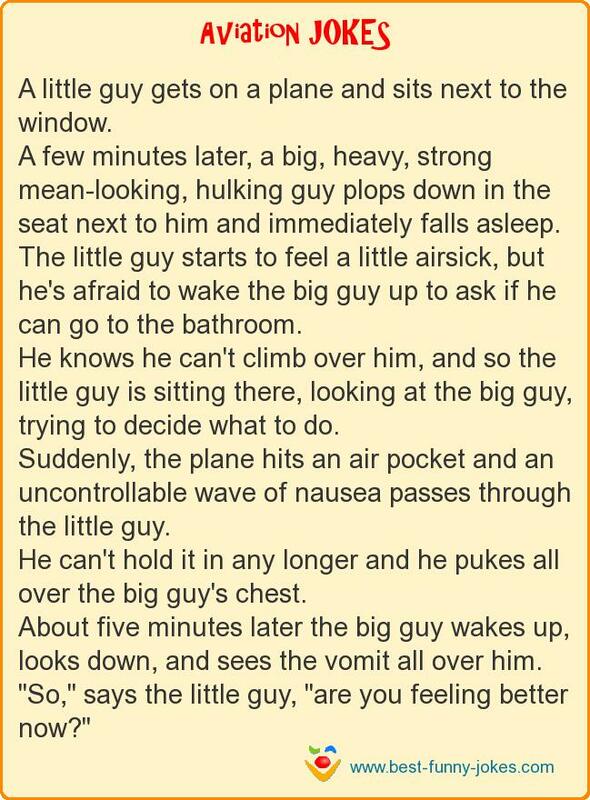 A little guy gets on a plane and sits next to the window. A few minutes later, a big, heavy, strong mean-looking, hulking guy plops down in the seat next to him and immediately falls asleep. The little guy starts to feel a little airsick, but he's afraid to wake the big guy up to ask if he can go to the bathroom. He knows he can't climb over him, and so the little guy is sitting there, looking at the big guy, trying to decide what to do. Suddenly, the plane hits an air pocket and an uncontrollable wave of nausea passes through the little guy. He can't hold it in any longer and he pukes all over the big guy's chest.